Rice crispies with an ingenious mechanism. I'm sure most of us have some sort of candy, snack or treat that would remind us of our younger days. It may not look like much, but this little box of treats was an important part of my growing up years as it served as a fun and exciting element of my life during those innocent years. I found this little treat in a local store around my area and I just had to try it again after missing it all those years. Who knows, I may have a different perspective of it now compared to back then. 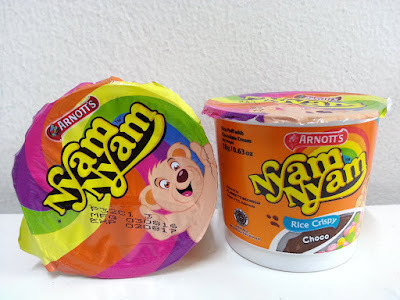 Nyam Nyam is a snack food comprising of 2 elements: coloured, puffed rice balls (around 0.5 cm in diameter) and a small tub of chocolate cream. It is the product of Arnott's, an Australian brand that has been around for quite some time, and believe it or not, began as nothing more than a humble bakery! Anyway, here goes with what I think of it.